- Plc based control system . - Touch screen operator interface . - Ac vector drives . - Automatic meter position memory . - Close loop unwind & rewind tension control system . - Unwind cantilever 3”(76mm) air shaft . - Rewind cantilever 3”(76mm) air shaft . - Image synchronized strobe . This is the detailed information for Re-reeling & Doctor Machine, INSPECT-J300. 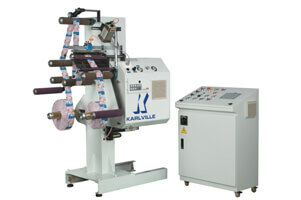 The information includes model, name, description and specification for Re-reeling & Doctor Machine, INSPECT-J300. Manufacturer of Inspection Rewinding Machine and more..